I'm sorry to say I'm only a recent convert to Doctor Who. Through the wonders of Twitter ,I had come to know and become a fan of Matthew Dow Smith's artwork. 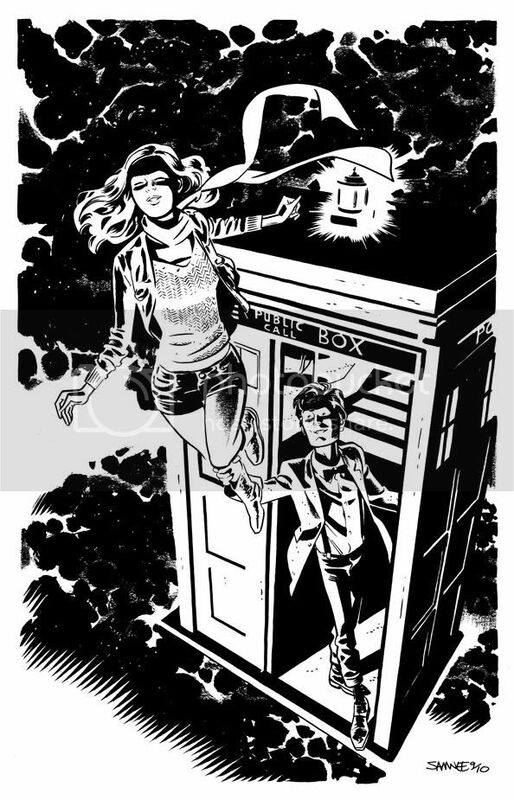 Luckily enough for me around the time of my first exposure to to his work Matt was the artist on the Doctor Who comic put being put out by IDW. So, in a bit of a backwards fashion, my first exposure to the Doctor was through the comics. He and Tony Lee's work on the Fugitive arc of the ongoing series to be precise. Needless to say I was hooked and quickly sought out the TV show that inspired this wonderfully offbeat comic. I started with the Eccleston episodes and made quick work of all the recent seasons. Just a few nights ago I finished making my way through the Matt Smith (no relation to Matthew Dow Smith by the way) episodes and couldn't possibly be more in love with show. Just top-notch stuff from beginning to end. So a big thanks to Matthew Dow Smith, for without his amazing work to follow and second-to-none enthusiasm for the material, I might not have ever stumbled on to something so fantastic. Cheers, Matt. Pencils for this can be found on my blog HERE. Absolutely stellar, Chris, you caught one of my favorite moments. MDS was who got me into the show as well, well him and the Breitweisers. Take it from me as someone that grew up hiding behind the sofa (hmmm... not sure that saying means as much in the US) that you have done the Doctor and Miss Pond proud! I just became a HUGE fan of the show this year and lately I have been watching an episode every morning during breakfast. I was just thinking the other day, how cool it would be if the amazing folks on Comic Twart would do a week of the Doctor.... And then you sir, make it a wonderful reality HAHA! imagine my surprise! -thanks! I like how blocky you made Matt Smith's head. It's simplified but very recognizable. Girl is very, very pretty too. Great piece, Chris. And thanks for the kind words. I've become a huge fan of you, as well. Jaw-droppingly awesome work here, Chris. Seriously consider making up a print of this. First Captain Marvel week, now Doctor Who... you don't have to program directly to me, though I appreciate that you are. That is Amazing! Has a very Kirbyesque feel to it!